Comedy Central's Jon Stewart insists that today's "Rally to Restore Sanity and/or Fear" is not political, but a closer look at the organizers, entertainment and celebrities involved may indicate otherwise. 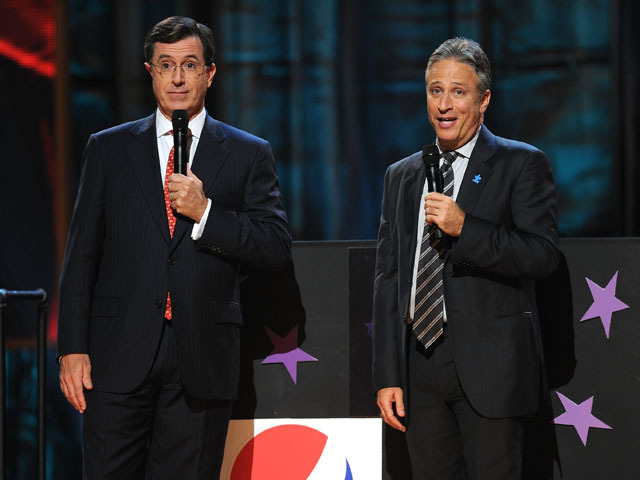 Stephen Colbert, host of Comedy Central's "The Colbert Report," is co-hosting the rally with Stewart, which begins at noon on the National Mall in Washington, D.C. There are also satellite events planned in cities across the country. The Democratic National Committee is among the groups organizing events in conjunction with the rally. There are no elected officials on the tentative schedule leaked this week, but one could argue some are still "political figures." Actor Sam Waterston was the face of "Unity '08," a bipartisan move to engage people directly in politics and identify bipartisan candidate alternatives. That group was founded in 2006, but suspended in January 2008 due to funding problems. Singer Sheryl Crow is a well-known liberal who has taken a public stand against the Tea Party, calling members "angry," "uneducated" and "potentially dangerous." This summer Crow released "Say What You Want," a negative song about Sarah Palin ("I saw you ranting on TV today/I heard you tell me to reload/You got a lot of nerve to talk that way"). In 2008 Crow endorsed and stumped for Obama, even performing at the president's Inaugural Concert on the steps of the Lincoln Memorial. Comedian Don Novello, whose fictional character Father Guido Sarducci has been featured on "The Colbert Report," is also the author of a political book making fun of Republicans called "From Bush to Bush: The Lazio Toth Letters." Mavis Staples, a blues and gospel singer, performed at the inaugurations of President Clinton and Carter and was a well-known support of Obama's presidential campaign. Speculation swirls that talk show host Oprah Winfrey may also attend the rally as a surprise guest of Arianna Huffington, founder of the left-leaning Huffington Post. Huffington announced in an appearance on the "Daily Show" that she'd provide free bus rides from NY to the "Rally to Restore Sanity." Oprah was an early and strong support of Mr. Obama's presidential campaign. Stewart discussed the rally on her show, and she also surprised a "Daily Show" audience by treating them to a trip to D.C. for the event. RNC Spokesman Calls Obama "Daily Show" Appearance "Sad"
Christine Delargy is an associate producer for CBSNews.com. You can read more of her posts here. For more of Washington Unplugged, follow us on Facebook and Twitter.